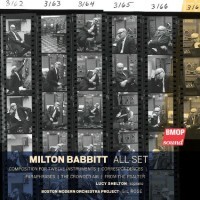 Milton BABBITT: Composition for Twelve Instruments (1948); All Set (1957); Correspondences (1967); Paraphrases (1979); The Crowded Air (1988); From the Psalter (2002). Lucy Shelton (sop), Boston Modern Orchestra Project, Gil Rose (cond.). BMOP/sound 1034 (1 CD) (http://www.bmopsound.org/). I met Babbitt once. We shook hands as I received an award, one student among many others on a winter afternoon a long time ago. Babbitt was a great raconteur. However, the anecdotes I heard are not suitable for print. He wrote dense articles, and yet his music can have straightforward elegance (Composition for Twelve Instruments) or humor (All Set). Truly, All Set is a snazzy 12-tone piece for jazz ensemble. Were it scored for a Pierrot ensemble it might seem bone dry, and if a jazz combo were provided atonal charts, this wouldn’t be the result. Regardless, I can’t help but listen and grin throughout. We must marvel that these six spry pieces span six decades. Correspondences aligns string orchestra with a tape of synthesized tones. The pointillist target practice reflects its time. This piece was once considered impossible to play; BMOP makes it easy. A scant four minutes, The Crowded Air’s 80 measures for Carter’s 80th birthday addresses a poem which Carter had set decades before. From the Psalter groups Psalms 13, 40 and 41. You might think that after Correspondences, Babbitt couldn’t present a winsome tune: not true. The composer of All Set grew up on American popular music and knew a thing or two about setting words to music. Cover and booklet show Babbitt hanging out with the RCA Mark II synthesizer. The slipcase shows Babbitt with Columbia-Princeton Electronic Music Center heavyweights Vladimir Ussachevsky, Bülent Arel, Pril Smiley, Mario Davidovsky, Alice Shields and Otto Luening. 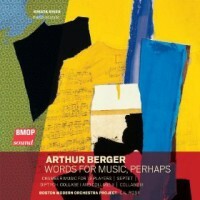 Arthur BERGER: Words for Music, Perhaps (1940, rev. 1987)*; Chamber Music for 13 Players (1956); Septet (1966); Diptych: Collage I and Collage II (1990, rev. 1995); Collage III (1992, rev. 1994). Krista River* (m-sop), Boston Modern Orchestra Project, Gil Rose (cond.). BMOP/sound 1031 (1 CD) (http://www.bmopsound.org/). BMOP expands the Berger discography with chamber music. The three Yeats poems require female voice plus trio of flute, clarinet and cello. Chamber Music and Septet make explicit their numbers. Berger’s notes reveal his struggles to forge an American serial style outside of Stravinsky’s influence. Chamber Music is one of the results of that development, an elegant combination which looks to Webern. Profoundly evident in these lucid works is Berger’s splendid handling of sonority. As befits their titles, the three Collage reassemble older works for different instruments. Collage I and II ask for flute, clarinet, violin, cello and piano; III adds percussion. They repurpose a wind quintet and four-hand piano piece respectively, discovering bright textures. 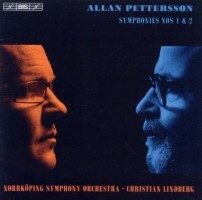 Allan PETTERSSON: Symphony No. 1 (1951; compl. Christian LINDBERG, 2010? ); Symphony No. 2 (1952-53). Norrköping Symphony Orchestra, Christian Lindberg (cond.). BIS CD 1860 (1 CD, 1 DVD) (http://www.bis.se/). 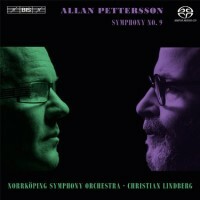 Allan PETTERSSON: Symphony No. 9 (1970). Norrköping Symphony Orchestra, Christian Lindberg (cond.). BIS 2038 (1 SACD, 1 DVD) (http://www.bis.se/). BIS intends to complete the Pettersson symphony cycle which Leif Segerstam started. Christian Lindberg and the Norrköping Symphony Orchestra are filling in the gaps, and doing extra work to present premieres of Lindberg’s realizations of the incomplete symphonies. Pettersson never completed his First. He didn’t quite abandon it either, just never wrestled it to a conclusion. It goes without saying that No. 1 is dense and meandering, and further, particularly overburdened and shapeless. It is however unmistakably Pettersson with snaking chromatic gestures, emphatic percussion, and screeching melodies. There are moments with vigorous repeated gestures which suggest Varèse (e.g. : ca 15:30 to 16:00). The realization’s final minutes consist of exposed lines over meager support, contrasting the opening’s driving, intertwining layers. When a viable performance opportunity beckoned, the composer started fresh. No. 2 suggests that Pettersson’s studies in Paris with René Leibowitz taught him a fair deal about purposefulness and economy, even if such concepts aren’t immediately associated with the morose Swede. The Second, a dense block at 47:23, comports itself well. The performance edition of No. 1 is 30:32. An accompanying DVD with an hour-long documentary details the completion’s effort. Two composition students, Truls Nilsson and Ulf Blomqvist, transcribed Pettersson’s sketches into a computer and Lindberg sorted out the rest. It’s actually not clear what Lindberg may have done, since Pettersson’s drafts were frequently illegible. Sixteen measures in the middle were unaccounted for when the realization was premiered, only to be found and recorded in time for the CD release. Perhaps inadvertently, watching Lindberg conduct removes any mystery. He is not particularly inspiring, but then again, tackling this music requires stamina and vision. Additional materials include photos and excerpts from Swedish Radio interviews. Compared with the realization of the First and the Second, the 70:11 single-block Ninth is thinner with less counterpoint despite its grinding pace. Material trundles slowly over square accompaniment, including an unexpected tango pattern in track six. Overall, the effect is like cars in traffic, proceeding when the signal is green, idling for a while, gradually gaining distance, unable to pass or change lanes. There are almost no bright moments – unusual for Pettersson. The final soft cadence is utterly unanticipated. No. 9 comes with a DVD offering Swedish and English-titled versions of a maudlin 82-minute documentary, Vox Humana (1973-78) by Peter Berggren, Tommy Höglind and Gunnar Källström. Black and white segments interspersed with historical stills portray Pettersson’s bleak childhood in a dysfunctional family. Interviews with neighbors are frank, just barely pitiable. It amazes that this unloved headstrong child took up the violin, studied the viola in Paris on the eve of the Nazi occupation, and later took up composition with Leibowitz. Towards the end, we see Pettersson departing an unsuitable apartment, inching backwards down four flights of stairs, and on his way to awarded state-sponsored housing (behind this gate). 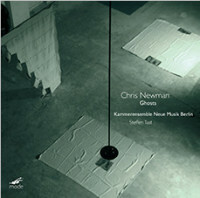 Chris NEWMAN: Symphony (1981); Cologne (1987); Ghosts (1994); Ghost Symphony (1998). Ensemble KNM Berlin, Steffen Tast (cond.). mode records 271 (1 CD) (http://www.moderecords.com/). Here are crisp performances of four chamber pieces representing nearly two decades of work by artist / composer Chris Newman. Some might have trouble actually hearing music. Newman’s style gives an impression of unschooled naïveté. The opening single-movement 12-minute Symphony declares Newman’s aims: Instruments tread in unison, generally contributing to one of two lines. The notes imply a “two-part counterpoint with itself” although traditional canonic activity is not immediately apparent. Indeed, harmony and structure are ignored, as if music notation was employed without being understood. The ear craves associations. Sometimes the aimless lines recall Satie or Wolff, although there is a hardness suggesting a short temper. The unison instruments (flute, clarinet, xylophone, piano, trumpet, trombone and double bass) imitate a synthesizer. Newman provides Cologne’s speaking part, a cut-up text extracted from travel brochure mistranslations haphazardly tossed over instrumental accompaniment. Ghosts’ events were guided by the structure of Ibsen’s play in no immediately evident way. Any halting imitations of jazz are probably accidental. Ghost Symphony (20:28) startles with actual triads and chords, which are but ornaments here. The chords are actually Beethoven’s. Newman has appropriated the first movement of the Fifth, applying new notes to Beethoven’s rhythms. Even if in on the joke, Newman’s choices make it hard to follow, and not just because the tempo is slow. 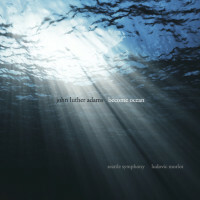 John Luther ADAMS: Become Ocean (2013). Seattle Symphony, Ludovic Morlot (cond.). Cantaloupe Music CA21101 (1 CD, 1 DVD) (http://www.cantaloupemusic.com/). Become Ocean surfaced on most everyone’s best-of-2014 list for whatever reason. Three cheers for Cantaloupe Music! As a 42-minute span of lushly maintained orchestral music continually cresting and ebbing, the music is not without merit. Certainly the massiveness impresses. I suspect a large-scale organization, such as gigantic intersecting palindromes. Comparisons to Sibelius are inevitable as different ensembles and materials arc and surge against cascading harp and piano. I am reminded of how Górecki’s Third topped the charts back in 1992. If you squint a bit, the compositions are similar. The piece’s title and booklet quote force serious reflection: All humanity is doomed to drown as the oceans reclaim the planet we’ve destroyed. Become Ocean is actually rarely dark, as if we should readily embrace our impending watery demise. The planet might actually be a nice place once we’re all gone. The DVD offers stereo and surround-sound formats against still images of oceans which distract from the work’s grandeur. 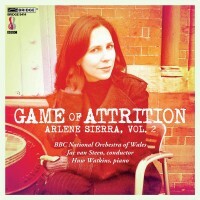 Arlene SIERRA: Moler (2012); Piano Concerto, “The Art of War” (2010); Game of Attrition (2009); Aquilo (2001). Huw Watkins (pno), BBC National Orchestra of Wales, Jac van Steen (cond.). Bridge Records 9414 (1 CD) (http://www.bridgerecords.com/). Designed after consulting scientific studies on teeth-grinding, Moler introduces us to Sierra’s turbulent world. I imagine the archetypal cartoon scenario where the good guy must outrun a conveyor belt before being sliced by saws or minced among gears. In The Art of War, ostensibly a piano concerto, the solo actor battles the orchestra. The first of two equally sized movements channels energy from grand statements into lighter concertante textures. The second movement returns us to the clenched teeth of the first. There is no winner; the piano is continually frustrated. Game of Attrition offers repeated notes with sinister edges. Different orchestral players must compete within the same narrow tessituras, including a particularly prominent harp part. Despite the agitated changes, everything is balanced. The oldest piece, Aquilo, reveals that Sierra’s propulsive style has been fully formed for quite some time, and that her palette and command of complexity has assuredly developed. Van Steen and the Welsh orchestra are strong advocates. I want to hear more. 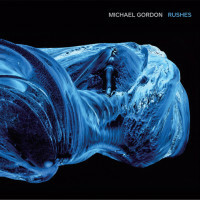 Michael GORDON: Rushes (2012). Rushes Ensemble: Dana Jessen, Saxton Rose, Rachael Elliott, Jeffrey Lyman, Lynn Hilemen, Maya Stone, Michael Harley (bsn). Cantaloupe Music CA21097 (1 CD) (http://www.cantaloupemusic.com/). A bassoon septet? Seriously? Because of their symphonic effect, let’s consider this near hour-long single-movement work for seven bassoons alongside other, more traditionally designed symphonies. The pulsing reeds phase and overlap across winding trails to create bewitching moiré patterns. A full 56 minutes, the precisely articulated nasal timbre grows mesmerizing, reminding one of a marquee with patterns of synchronized flashing lights. Massed bassoons can summon dark motifs à la Wagner, but Gordon’s minimalist and jazzy writing more often reminds of the frenetic, nose-thumbing moments in Andriessen’s De Staat. Admittedly this sort of extravagance isn’t for everybody, but for some of us, we can’t get enough of it.